Now, while these words may sound reasonable to a layman’s ears, the blatant historic revisionism behind them is literally painful to read for anyone who is familiar with the facts on either the Greek or the Argentine crisis. Structural adjustment failed. It failed painfully. Horribly. It destroyed nations. It crashed markets. It impoverished millions. In fact, Argentina’s default in 2001 was a major success story, and marked the start of one of the most spectacular turnarounds in any country’s economic history. Argentina’s default allowed the country to return to growth levels that were simply unimaginable as long as the country remained shackled to the IMF’s brutal loan conditionality. 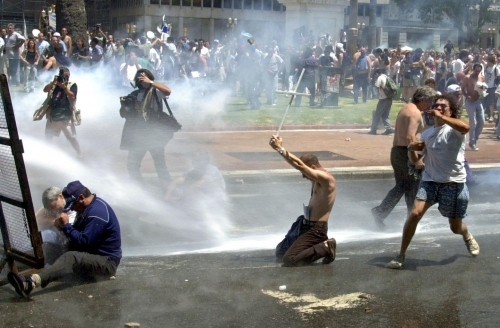 The conditions that the IMF imposed upon Argentina (austerity and structural reform) led to the exact same outcome as they are causing in Greece today: economic collapse combined with a humanitarian tragedy and total social disarray. Sooner or later, Greece will be forced to default — just like Argentina. And it will be for the better. 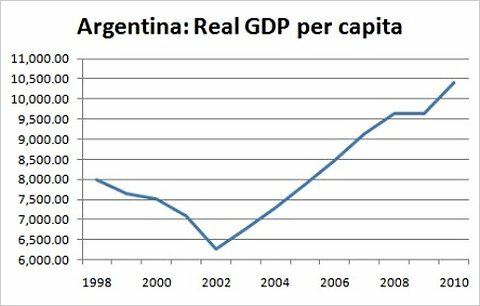 Argentina suffered terribly from 1998 through 2001, as it tried to be orthodox and do the right thing. After it defaulted at the end of 2001, it went through a brief severe downturn, but soon began a rapid recovery that continued for a long time. Surely the Argentine example suggests that default is a great idea; the case against Greek default must be that this country is different (which, to be fair, is arguable). Just in case you’re still not convinced, let’s bring in Mark Weisbrot, Co-Director of the Center for Economic and Policy Research and one of the world’s leading experts on the Argentine crisis of 1998-’01. Check out this article of his from 2008 – what a refreshing experience to see someone providing factual evidence to back up their claims! I think these two graphs speak for themselves. If the BBC is serious about continuing to provide objective, high-quality journalism, I would strongly recommend them to sack Mr Plummer — or at least to send him to a basic economics class. I never heard such shocking nonsense coming from such a respected broadcaster before. The Libyan state TV would be jealous.